Blend all above ingredients in a blender until smooth. Then add 6 Tbsp. sliced pickled jalapenos and pulse the blender until the jalapenos are roughly chopped. You don’t want to blend them in. Sometimes I blend in one bunch of cilantro leaves (remove the stems). 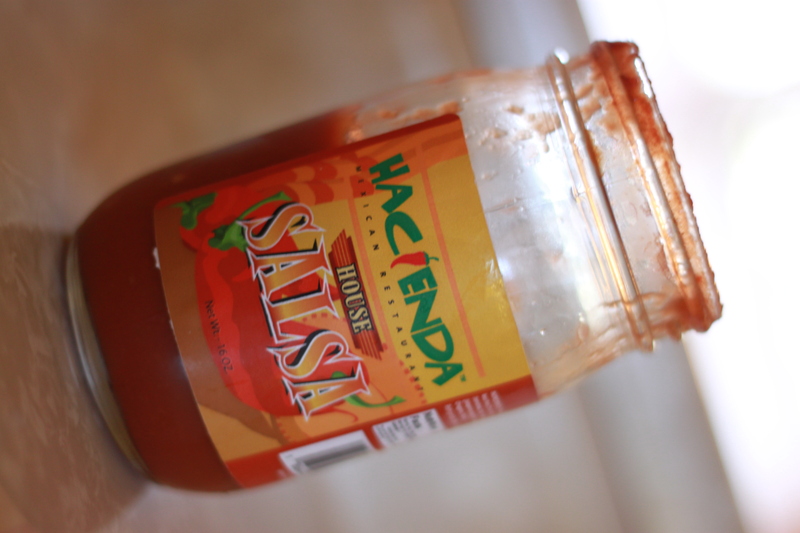 I personally like the flavor of the salsa with this but it does make it different than traditional Haciendas. Chill for 24 hours for optimal flavor…or just eat right away because its so stinkin’ delicious. Why are you still sitting here listening to me ramble on…go make some already! I am still going to make it one of these days! If you haven’t made this yet, you are missing one of the truly great salsa recipes that is dead-on to the restaurant item. Pair with “On The Border” chips and you will think you are at Hacienda. Thanks Robinson family! Yep you sure can. It will be a little different in consistency from the restaurants variation of salsa however. Make sure to remove the skins from the tomatoes. The easiest way to do that is to place all your tomatoes you’d like to use on a baking sheet and roast at 450 until they begin to brown a bit. Flip the tomatoes over and repeat on other side. Remove and allow to cool. Skins should slide right off the tomato flesh and you can use these cup-for-cup the same measurement at the tomato sauce the original recipe calls for. As an STL expat, this salsa is 1. Spot on, and 2. Life-saving! Thanks!! Do you know how to make Hacienda’s beef taco meat? I’m glad you have enjoyed it! We still enjoy it to this day. Oh man, I wish I knew how to make their taco meat. If you ever figure it out please come back and let us know! Yes Fresh tomatoes and jalapenos will work however you will need to make a few changes. You will for sure want to dip your tomatoes in a pot of boiling water to take the skins off. You will want to add some vinegar (apple cider vinegar or white vinegar should work fine) to substitute for the pickled jalapenos. And you will probably want to take the seeds and ribs out of the jalapenos to keep the heat down to Haciendas Salsa spiciness. The product will for sure be different than the Original Haciendas Salsa recipe, but it will be yummy.